Stories of bullying and harassment in schools have become all too familiar. But there is another form of silent abuse that has been found to be just as devastating – and may be going unnoticed. Recent research has found that ostracism, being ignored or shunned by others, can actually be more painful to some individuals than bullying or physical harm1,2. While forms of harassment and bullying can be viewed on a spectrum, ostracism has measurable consequences and should be taken just as seriously as physical and verbal abuse. In fact, the negative effects of being ignored can be long lasting and have been found to lead to health problems, suicidal tendencies, eating disorders, and a reduction in psychological motivation (that is, the initiative that drives us to act on goal oriented behaviors like getting a drink of water when we are thirsty)2, 3. Additional studies have found that kids with special needs or chronic illnesses are at particularly high risk of developing depression as a result of being left out4. But how can this be? How can something so simple as ignoring someone be just as painful (and sometimes more painful, depending on the person) than bullying or harassing them? The answer lies in our evolutionary past and how our brains have evolved to recognize such abuse. Ostracism is one of many forms of social pain. When social pain occurs, it is detected in the same regions of the brain as physical pain5, 6, 7. Taken from an evolutionary perspective, the ability for the brain to recognize and respond to social pain, in the same way it responds to physical pain, is essential for one thing: survival. For our ancestors, being the victim of social exclusion meant the loss of social bonds in addition to becoming vulnerable to other factors, such as lack of food and protection. While this is something modern humans don’t have to worry about now, the residual effects of these survival tactics still appear to be present in our brains. Experiencing ostracism may trigger the brain to think that there is a threat to some of our most basic needs. In order to cope with this, individuals have been found to act more pro-social in an effort to be re-included in the group. In fact, recent research within developmental psychology has found that young children who feel ostracized will imitate others in the group in an attempt to re-affiliate themselves with other group members 8. Research has also shown that some individuals are at a higher risk of experiencing the effects of ostracism than others. One factor, age, may play a role in how affected you are by social rejection. This may be because brain regions associated with social cognition continue to develop well into adolescence 9. Researchers have suggested that this ongoing neural development may be one of many reasons for why adolescents seem to be more affected by what others think of them and by rejection than adults and younger children, possibly because the ability to regulate and handle “distress from ostracism continues to develop between adolescence and adulthood”10, 11. Additionally, research has found that kids who struggle with special needs (from ADHD to autism to chronic illnesses such as cystic fibrosis) are at a higher risk of experiencing ostracism and depression as a result. Even when other demographic factors were controlled for, social rejection was revealed to be the strongest predictor of self-reported depression in kids with special needs4. Whether it’s being shunned from your group at school or being ignored on the playground, ostracism is one of the most devastating experiences a child (or adult) can endure. We strive to fit in: not only to have friends, but because it was necessary for our ancestors’ survival. Now that research is beginning to show how harmful ostracism can be, we need to act in order to lessen its lasting effects on our children. Informing policy makers of this growing body of research – this can ensure that appropriate preventions are being implemented. Provide a safe and supportive environment. By doing so, parents, teachers, and school administrators not only provide kids with the opportunity to discuss their experiences with bullying and ostracism, but also create an environment where kids can feel like they belong. I can attest to this. I was not a pretty child and we were poor. I was bullied some – but mostly ignored. No friends. No parties ever. No dances or proms or dates. No hugs or loving words from anyone. I went whole days without a soul even speaking to me. I went a week in middle school without bathing and no one noticed. It still hurts – even at almost 60 years old. I do not go to my high school reunions – why would I? Not a single good memory. And yes, I ended up with depression. But! I have had plastic surgery and have a husband, a college degree, and 2 kids! Understanding why and just how you re being ignored can actually help you streamline your thoughts and focus on the problem, without really letting the other confusions get in the way. 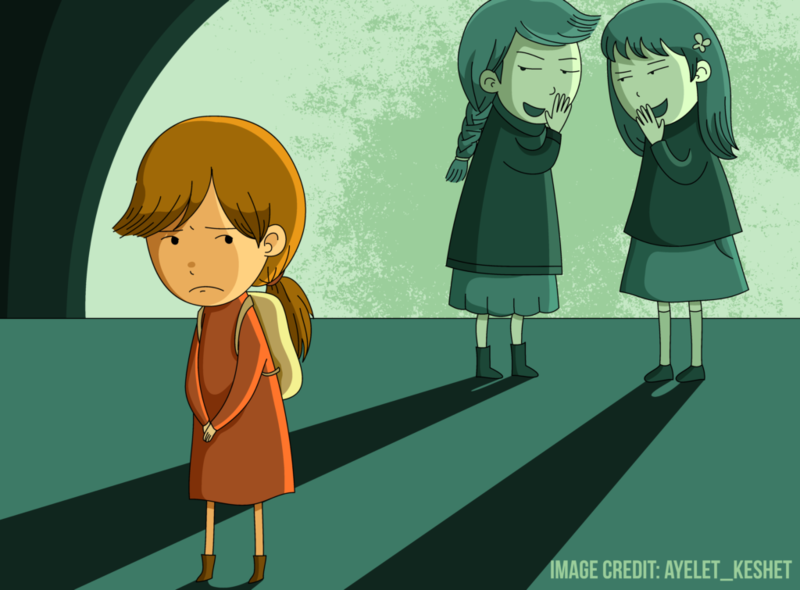 I am a school counsellor and it is all very well to identify ostracism but even when measures are taken to help students make friends, it often does not work. Do you have any suggestions for how to help young teenagers who have difficulties making and keeping friends do so more effectively?